Goalkeeper Asmir Begovic says he will warn his team-mates about the quality of Jon Walters ahead of Bosnia-Herzegovina's Euro 2016 play-off clash with the Republic of Ireland. 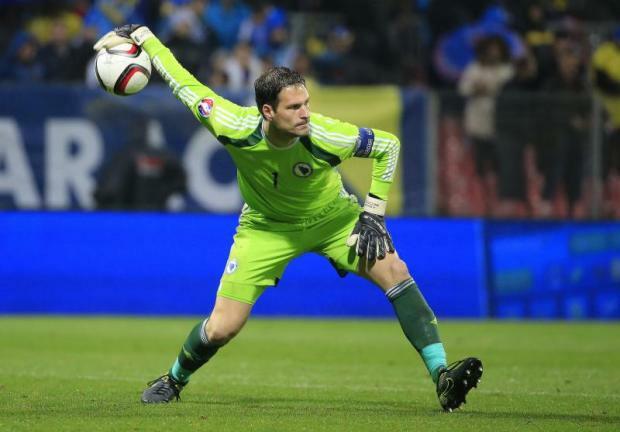 Begovic and his team-mates headed for Dublin having dragged themselves back into the tie through Edin Dzeko's late equaliser in a 1-1 draw at the Bilino Polje Stadium in Zenica on Friday evening. Martin O’Neill’s Ireland will have fresh faces available for Monday's meeting, including Walters, who will be familiar to Begovic following their time together at Stoke. Walters joined City in 2010, followed by Begovic six months later and they were team-mates for five years, before the shot-stopper moved to Stamford Bridge in the summer. The Chelsea keeper was full of praise for the 32-year-old, who recently signed a new deal with the Potters. He said: "I expect a lot from Jon. Jon's a good quality player and he's going to strengthen their side, but we're trying to prepare as much as possible and it would be nice to get one over him. "I will speak to some of the defenders in our team about Jon. He's a good quality player and a seasoned pro that has played in the Premier League for a very long time. His quality is there for all to see. "I'm sure he'll be excited for about the game, but I also think we'll be ready for his qualities and try to limit him as much as possible." Ireland's away goal may give them a slight advantage, but the 28-year-old insists there has not been a clear favourite since the draw was made, and there still is not. Begovic is convinced the tie remains on a knife edge as the sides prepare for the decisive second leg. He said: "Honestly, before the first tie it was two evenly-matched teams. I don't think there was one clear favourite. As the first game showed, there's not much between the two sides and I expect more of the same tomorrow night. Bosnia will have Everton midfielder Muhamed Besic back from suspension, although coach Mehmed Bazdarevic will make a late check on midfielder Mensur Mujdza after he limped off in the wake of a hefty collision with Ciaran Clark in Zenica.